right on Vilnius’ main street, Gedimino Avenue, which is a shopping and business centre. The small 2 star hotel is very close to the Cathedral Square, National Drama Theatre and a number of restaurants, cafes, bars, clubs and shopping centres. Decorated in patterned fabrics and dark wood furniture the rooms have a very basic, rather non eye-catching interior. However, the rooms are clean and well appointed. Some of the rooms are really spacious and have comfortable beds. Try to ask for a room with a balcony that has a view of the bustling Gediminas Avenue below. 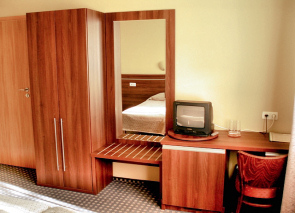 All rooms have a cable TV, telephone, a shower or a bath and are equipped with all common facilities. Friendly staff are usually very helpful and ready to assist. They can book tours on your request. The hotel services include free parking, individual safes, express laundry and dry cleaning, airport shuttle. A nice buffet breakfast is served from 07.00 -10.00 and is included in the room rate.The hotel's restaurant is open from 08.00 - 22.00, also serves lunch and dinner. Pets are allowed at no extra charges. Free Private parking is possible in the backyard (reservation is needed). No Internet access available, however there is an Internet café next door to the hotel. If you wish to read other people’s reviews who stayed at the Ambassador Hotel, check out available booking dates, click on the link below.